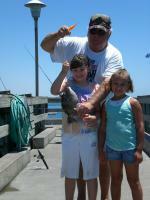 Sharing his love of fishing with his granddaughters Gillian and Alexis! Mr. O'Higgins, a long time friend of Channel View, doing what he loved most... fishing! With his friendly, outgoing personality and his love for fishing, he never met a stranger while fishing on the pier. He will be dearly missed, but never forgotten.